Somewhat in the shade of the more famous church of South Lopham a mile off, St Nicholas also has a big tower. But here, it is exactly the opposite of its neighbour. 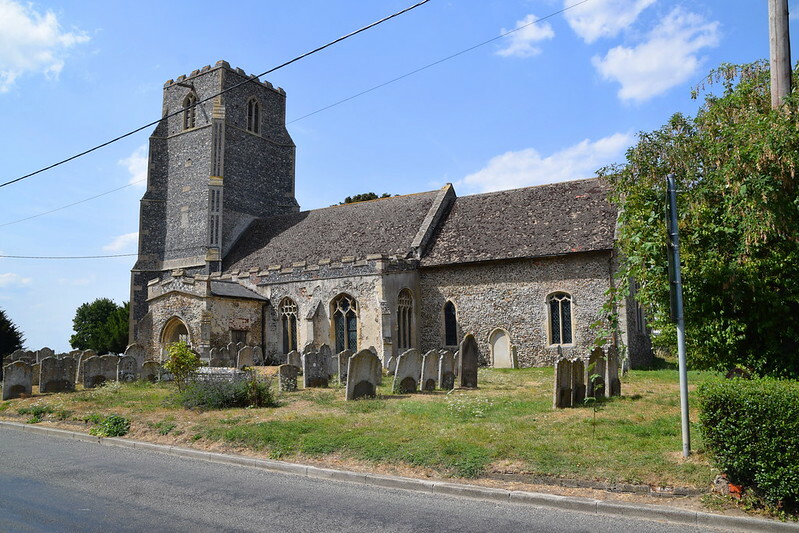 There, St Andrew has East Anglia's grandest Norman church tower, but the tower of North Lopham was built right on the eve of the Reformation, and retains its massive dedicatory inscription, asking us to pray for one of the donors, on the south side. 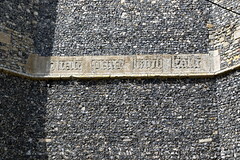 Above are the initials of other donors, and below on the base course you'll find a Marian crown, a Trinity T and a crowned letter A, because in medieval times this church was dedicated to St Andrew, not St Nicholas. The modern dedication is a result of an error by 18th century antiquarians, who transposed the dedication here with that of South Lopham. 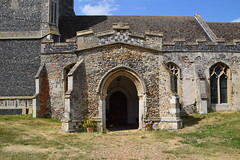 The tower was completed in 1526, about 400 years after that of South Lopham, and barely 20 before such things as inscriptions requesting prayers for the dead would become anathema. Aside from the tower, there is nothing so very remarkable. 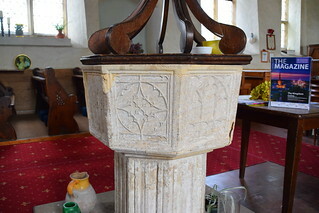 The 15th century tracery font is almost exactly the same as the one at South Lopham. Bill Wilson, revising Pevsner, misread his notes, or possibly just mixed his index cards up, when he recorded the bench ends with tracery and, instead of poppyheads, animals and a figure. All the furnishings here are Victorian, but there are medieval animal bench ends and a poppyhead replaced with a figure across the fields at South Lopham. Pretty much everything else here is Victorian too, other than the George III royal arms and the 18th century lead plaque from the roof recording churchwardens' names, now on the back of the south door. The 1860s east window, depicting scenes in the life of St Mary Magdalene under canopies, is very good of its kind. It would be interesting to know which workshop made it - Birkin Haward thought it might have been a local workshop, but it seems too accomplished for that. So, no great excitements. 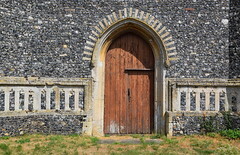 But this church is homely and peaceful, which I like, and it is a thoroughly friendly, welcoming church, obviously keen to welcome the pilgrim and stranger within the gate, and I like it a great deal for that as well. 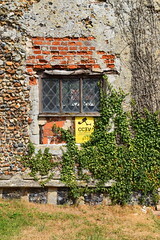 And, although South Lopham may take the crown for its church, North Lopham is the better village, one of the most interesting of its size in Norfolk, full of fascinating buildings along its mile-long village street. And, when you get to the top, the Kings Head pub is also recommended.